These are the Mood beads we are calling Twilight. Sunrise mood beads in varying states of "warm". Here is quite a special piece, full of colors and joy! And quite easy to knit as well. We found some most intriguing mood beads (also know as Mirage beads) that change colors depending on temperature and other factors (dare we say they are magic?). They are made up of what is called thermo-sensitive liquid crystal on a silver base and the changest they go through as a result of body temperature is how they got the name of mood beads. We came up with this very simple design. 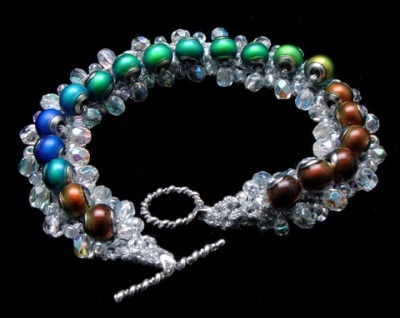 In our original bracelet, the Mood beads are surrounded by Crystal AB 8/0 beads as well as Firepolish 4mm Crystals. The crystal look gives the impression of snowflakes shining through the light. Your kit might contain Silver Lined Crystal AB 8/0s and/or Crystal/Marea or Crystal/Vitral Fire Polish Crystals for a bit more "pop"! The kit will include at least enough of these special changeable beads plus the 8/0s and fire polish crystals to make a bracelet of 8 inches. Plus the clasp of course. If you want extra for a longer piece, email me privately and we'll work it out if you'd like extra of these special beads. 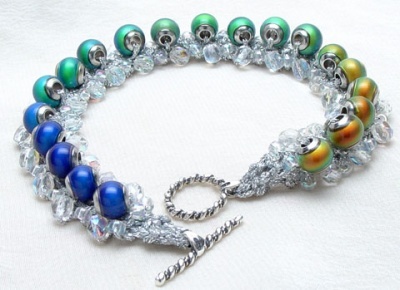 Alternatively, for a longer piece, some of our customers have noticed (since we enclose lots of extra 8/0 beads) that they can simply space the Mood beads a bit further apart (with extra rows of 8/0 beads in between) and get a longer piece. 1. The finished bracelet you see it on this page was knit with the original mood beads. These are beads where the colors are what I call Twilight colors, beautiful cool tones mostly. 2. 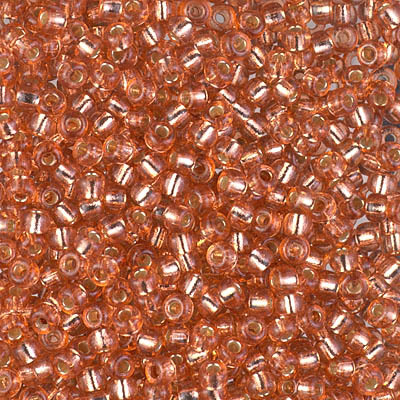 We have a limited supply of mood beads that turn warmer tones, what one might see at dawn. We are calling these the Sunrise colors. Think of the colors of delicious sorbet -- and look at the last photo on this page. The bracelet was done, btw, with size 0 needles (not included in kit). The photo shows the piece done with silver thread. Each kit will include the thread, the beads, plus the crystals as seen here and though the clasp will be a different one it will still be a silver look. We think it could also look superb with a gold thread glowing through the crystals and surrounding the colored beads (and with a golden clasp). So that option is available as well. 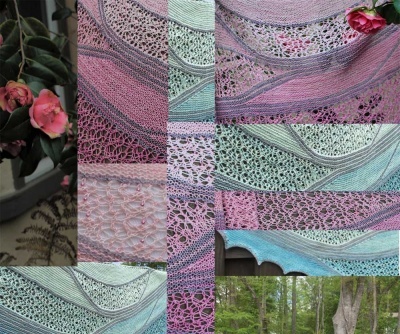 Notice that you have a choice of getting this kit with or without the pattern. Make sure to check the drop-down menu. We offer three options. I know some knitters have made so many of our knitted bracelets that they might feel they do not need another pattern. That's fine --- simply choose "No Pattern Needed." Alternatively, if you would like a printed copy, please make sure the "Pattern" drop-down menu is set to that.